MusicTrans is a powerful music analysis tool, there is a lot of controls that you can move until you get those little details that you are trying to hear. This guide will try to help you get the most out of it. The main user interface is divided into three sections: Audio Wave, Note Analyzer and Controls. The Audio Wave lets you keep track of what part of the song is being played, you can zoom in and out, move to a particular part of the song etc. 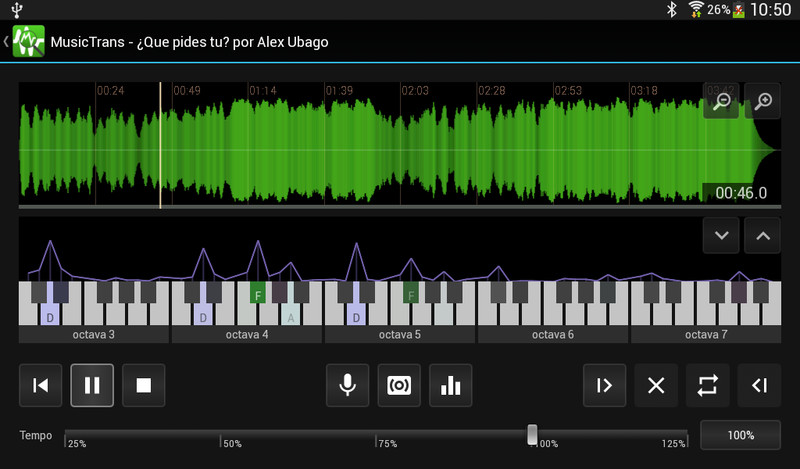 The Note analyzer will show you what notes are being played. This is based on a mathematical analysis of the sound, so your ears will always be the final judge. This is a realtime processing, if you move any control that affects the sound, the note analyzer will process the new sound instantaneously. This is a visual representation of what is being heard. The Android version includes a coloring scheme to help you identify the notes at first glance, after using it for some time you will be able to just jump into the notes without the need o read the names. Note that this is not a “pure” representation. If that would be the case you would see a lot of notes that are not notes in the musical sense, but part of more complex sounds like waves produced by drums or other percussion instruments. MusicTrans applies several filters to make this more closer to what our ears perceive as notes. Weak signal removal: Those notes that have less power than a minimum threshold will be removed. This helps to give more importance to notes that are more prominent. Possible values are None, Low, Medium and High. Percussive sound removal: Percussive sounds will affect many notes in the spectrum, making the musical notes disappear for some milliseconds. To avoid that, MusicTrans can detect when a note analysis results looks more like a percussive sound, discarding it. Possible values are: None, Soft, Medium and Strong. Reaction to change: The note analysis results can change a lot between several consecutive frames (milliseconds), and this is worsened by the effect of percussive sounds. MusicTrans allows you to keep the most prominent notes for some time, even when they may have been hidden by percussive sounds. Possible values are: None (no modification), Fast changes, Medium, Soft and Smooth. Peak detection: Not all notes have the same power in the spectrum. Normally lower frequency notes will have more power, and that will make higher frequency notes look less powered. Older MusicTrans versions used only the highest powered note as a reference, so higher frequency notes looked always like small peaks in comparison, sometimes they turned indistinguishable. The newest versions can divide the whole spectrum in “peak zones”, so each frequency has a different peak reference. This results in better visualization of less powered frequencies. Possible values are Flat (1 peak), Normal (5 peaks), Detailed (10 peaks). Peak stability: Peak notes can vary a lot in some songs, making the analysis look like changing a lot. To avoid that, MusicTrans can use an average of the last peak values thus stabilizing the final output. Possible values are None, Unstable (3 last peaks), Medium (6), Stable (10), Deep (20). Peak dynamic range: When using more than one peak, they can be very distant one from another, producing some steep changes that will make some notes appear louder than they really are. This control allows you to reduce the peak distance to have a more stable peak reference along the different octaves. Possible values are Wide, Medium and Tight. The voice removal effect is not really a voice removal, but it works like that in a high percentage of songs. Heres comes the explanation. One can say that a stereo recorded song is composed of two audio signals, one is for the left ear and the other is for the right ear. That creates three audio channels, one is at the left, the other one is at the right, and there is a center channel where you listen the sounds there are coming equally from the left and right. This center channel is used to record the most fundamental sounds in a song, these are the vocals, bass and some parts of the drums. A typical rock song will have two different guitars at left and right, may be some stereo keyboards and so on. So if you remove the center channel, then the voice, bass and drums are removed and you will end only with the stereo sounds: guitars and keyboard. Although, you may end with some voice signals, like stereo choruses or secondary voices that are recorded in stereo, those cannot be removed because they are not in the center channel. In MusicTrans you can adjust how much of the center channel is removed and there is an additional control to preserve some sounds of the center channel. You guessed: bass and drums. The lower left slider adjusts how much bass will be preserved and lower right slider adjusts how much treble will be preserved. In many songs just adding some bass will help a lot to add some information about the notes being used with the vocals removed. Sometimes, you need to focus on one of the three stereo channels, for example some recording has a guitar in the left and a synth at the right but you want to focus in only one of those. Or sometimes you want to listen to a guitar solo that is recorded in the center channel and would love to lower the sounds that come exclusively from left and right. The other controls may be used without further knowledge. If you want me to add more information to this document, just request it via fcatrin at gmail dot com.